I spent a February Saturday morning at a small truck show in Altona, VIC. Matt suggested to go for a drive along Great Ocean Road since Altona is already half way towards that direction – given I was staying on the East side of Melbourne. So that sunny afternoon, I met Matt in the show parking area. 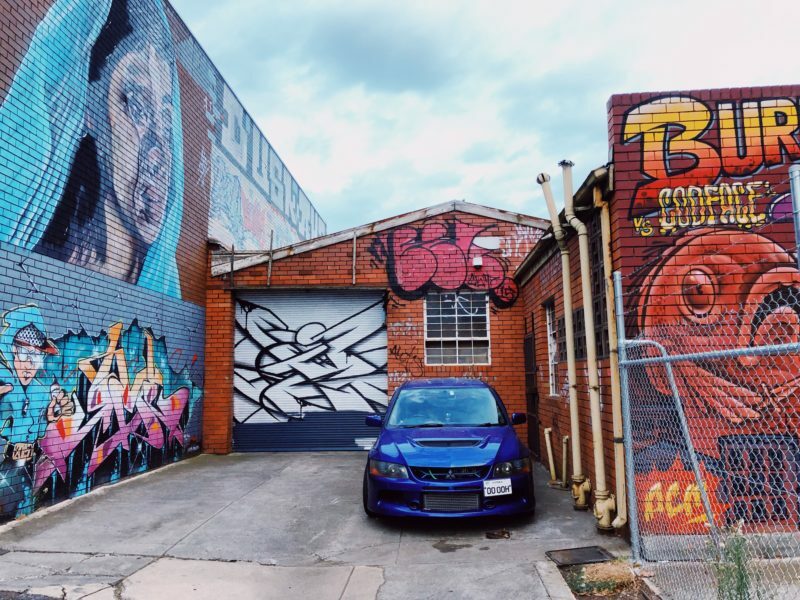 The blue EVO9 stood out quite significantly among the UTEs and SUVs in the lot. We rolled down the windows and soon, were cruising on the national highway towards West. I have the habit of listening to car’s exhaust and BOV tone while driving. A little window crack always make me feel more connected with the running machine. Plus, who would know that your AC is be broken and you’re simply desperate for cool air….? We took a pit stop at Geelong’s petroleum. 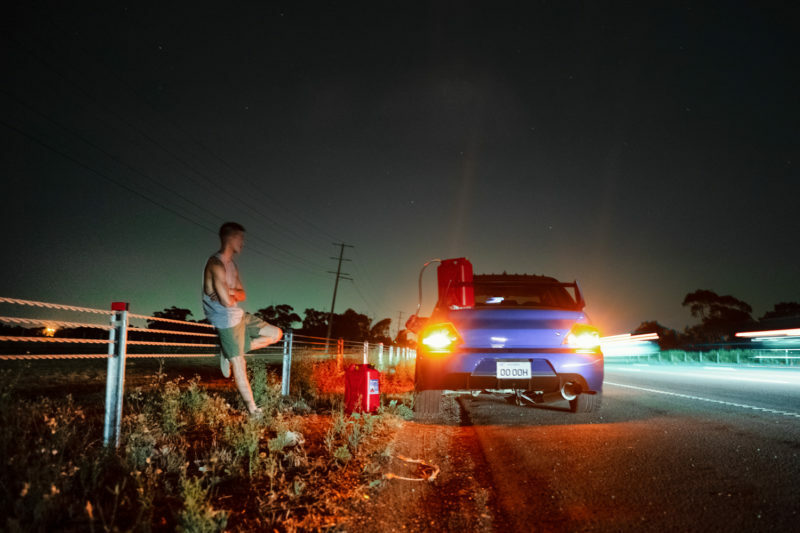 Since this blue monster was tuned on E85, sufficient fuel supply can always be an issue on roads. I knew Matt had got everything prepared as he opened his trunk full of jerry cans..
Great Ocean Road is rated as one of the top road trip routes in Australia. Although single lane traffic can make you frustrated when a slow driver tunes down everyone’s speed, the combination of ocean and mountain scenery will always bring travellers some sort of breeze. Many Australian states regulate the type of vehicles young drivers are allowed to operate. 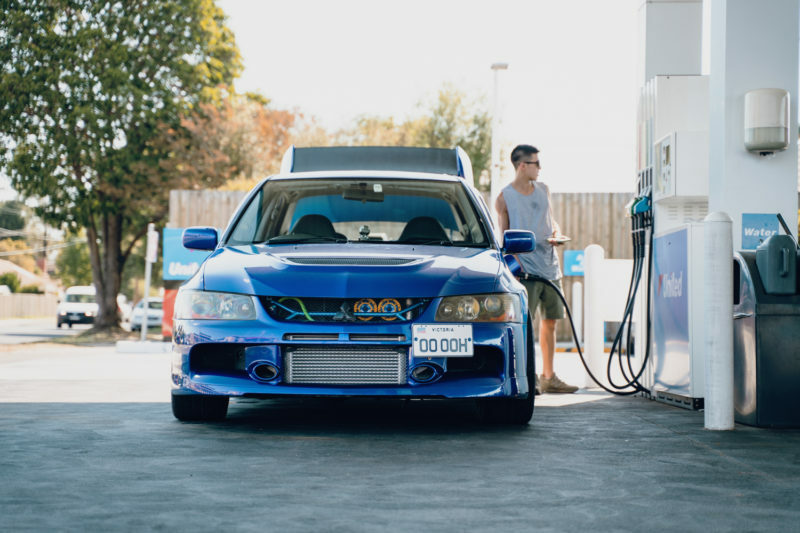 Thought been wanting a EVO since young, Matt was only able to take this baby home when he turned 21. When he took the key from its original owner, it was a “virgin” with low milage – the dream girl he had been looking for. His plan was to keep it stock with minor generic mods such as exhaust. Maybe this is the point where you can joke that his plan failed “miserably”…. He described his mental process in detail to make sure I understood his decision making, and of course, the obstacles and frustrations along the way. 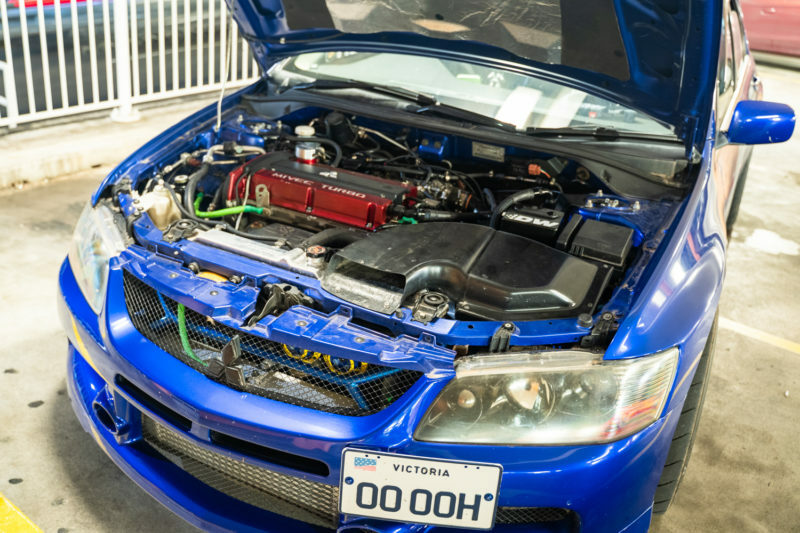 The EVO 9 lacked a bit of power from factory. Its 4G63 block is typically limited to a power of approximately 280-310 KW. I knew I’d crave more than 300KW. I decided to build 4G63 stroker engine. It is a 2.0L from factory and as you go up in size with the turbo to create more power, generally it creates lag as a compromise. There are a few ways to build an 800hp+ EVO. Firstly we can upgrade the internals within the standard EVO 4G63 motor. With this combination, a displacement of 2.1L, 2.2L and 2.3L can easily be achieved with the current technology / aftermarket parts available to us. Secondly, we can source a 4G64 block, commonly used in the Mitsubishi Magna and Outlander. Or for the U.S market, Mitsubishi Eclipse, Mitsubishi Galant, Hyundai Sonata, Chrysler Sebring or Dodge Stratus. With a 4G64 block, a displacement of 2.4L can be achieved using the standard crankshaft or de-stroked to 2.3L, 2.2L, or 2.1L, with a various combination of aftermarket parts available to us. One thing to consider when selecting the block is the cylinder head. If you will be using an EVO 9 head, you’re best to stick with an EVO 9 block with the Mivec feed lines from factory. Otherwise, you may need extra machine work. All EVO cylinder head’s prior to the IX (9) don’t have Mivec and won’t require this feed. The availability and cheaper price made 4G64 a better option for when you blow your original 4G63 and in need of a new block. My standard 4G63 block was still in good condition and I was using an EVO 9 cylinder head with Mivec. I decided to forge the internals and settled for a Nitto 4G63 2.3L stroker kit. To cut off some frustrating rants, Matt encountered some obstacles when the shop that promised to finish his build within 1 month not only delayed the whole process to a period of 1 year, but also delivered him a result beyond disappointment. Sometimes opportunity shows up when you are least expected. As Matt was “taking a break” from the car, he met a well-experienced mechanic in the EVO scene – Jeff from Techsport. 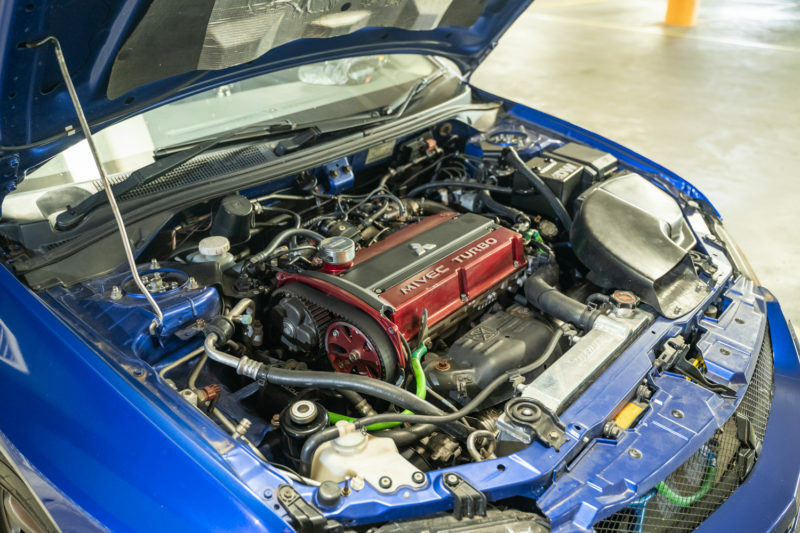 With Jeff’s help, he sourced a new EVO 9 engine which has been going strong to date. As for exterior, several aero dynamic parts are waiting to be put on after a full repaint. The Ruri Blue is currently paired with a set of bronze TE37, but he also has a set of white TE that he would like to refinish to other color. I’d suggest to keep the white but who knows if Matt can keep them free of brake dust like a show car.